Twitter. Are you an excitable user, where Twitter is your first point of contact to the world, the priority when sharing your companies’ news, an integral part of your influence and marketing? Or is Twitter is a job on the list of things to do, a tricky and time consuming ‘must’ when trying to spread your personal or corporate brands… you might not get it – but you know it’s somewhere your brand has to make an appearance. Whether pertinent news drips from your fingers or you deliberate over every character, as soon as you press ‘Tweet’ your lovely shiny bit of news and influence tumbles along in a sea of others’ news and influence. Take. A step. Back. Can you see your bigger influence trajectory on Twitter? Do you know what you want to do in 2018? Are you lost in a sea of insight statistics that you haven’t checked for weeks, trying to reassemble your maths GCSE to see if you’re doing any good?! Here are some Twitter New Years resolutions to start 2018 a bit more confident that all your effort is getting you somewhere. #1 – Get some clarity. Our desire to see how well received each tweet has become is a natural addiction. It is a case of ‘variable ratio reward’ – we never know how well each post will do. If, however, you’re just counting number of likes and retweets without asking the bigger picture questions ie. are these likes from regular engagers? Has the tweet resulted in the behaviour you want? How many of these tweets will result in the behaviour you want? Then you are guilty of only tracking Vanity Metrics and not Clarity metrics. To track Clarity metrics, you must ask not only, ‘is this Twitter data useful?’ but also ‘What can I do about it?’ – Tracking what you are doing on Twitter in parallel to useful data about who and why are people engaged can give depth and refinement to future activity. 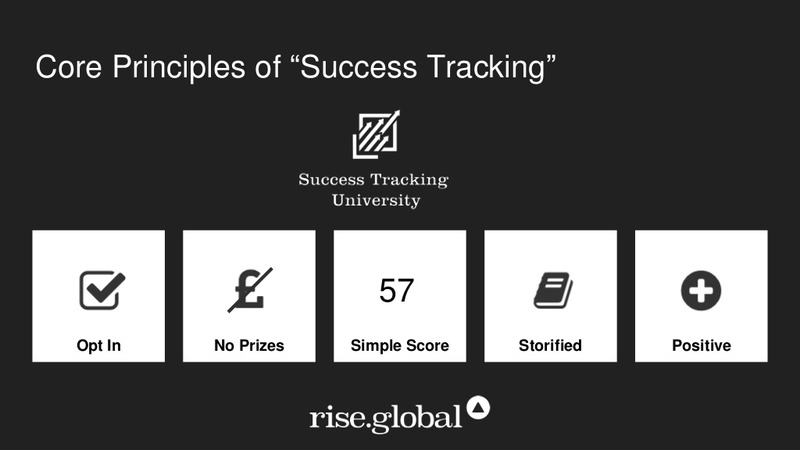 Rise.global consolidates the data you want into one simple score, that you can access easily and check every week via the app online, email or twitter. By just checking your score, you can quickly see and keep track of how you’re doing on the data you actually want to track. You choose the metrics, Rise fetches the data and puts it into an easily understandable format and if you did have that time and brainspace, you can always dig down into each metric individually to see how it’s going. We can all learn from others, especially others in the same sphere as our brand. Look at how others are using Twitter innovatively and ask the same Clarity questions as you ask yourself. How many regular engagers do they have? And what are they doing to keep them there? Add to and shape your strategy and then use Rise to track what you’re doing to keep you accountable to the goals you set yourself. Rise can also track the same metrics in your competitors. Just add your competitors accounts to your ScoreBook and you can see their scores with yours, and again dig down into their metrics to see where they are gaining success. The New Year, New You approach only works when you’ve done the ground work to keep it accountable. Set up tracking and attainable goals in easy to manage chunks so you don’t give up in the short term, don’t forget to track the Clarity metrics first and keep listening to others in your sphere. To get your easy to track score or build your ScoreBook of competitors or colleagues, sign up for your free trial here. This is a great example of how just relevant feedback, storified and positive, is driving my behaviour change. Great to see #success tracking at work.